Happy summer, and welcome to the half-way point of 2017! It’s the perfect time to look back at our goals, decide if they’re still what we want, and refocus. Alamy: Since January, I started a portfolio and added about 60 photos. Just last week I made my first sale there – for $56! Alamy’s different, in that you don’t make as many sales, but you make a lot more per sale than with microstock agencies. Time to keep building my portfolio. Magazines: So far, I’ve published one story in online magazine WAVEJourney, and sent in a couple of pitches to print publications… but I haven’t hit that one very hard. 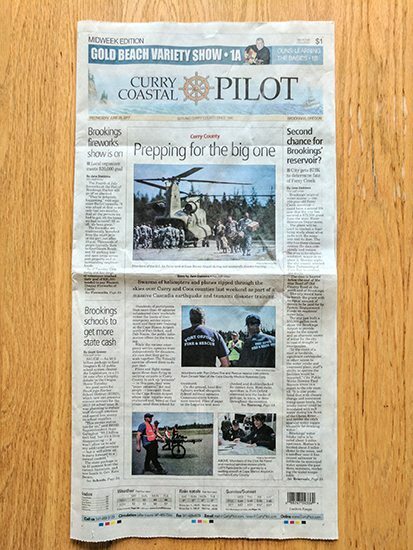 Though some of my event photos made it to the front page of the local newspaper this week, which is fun. Alamy: Add 100 more photos by October 1, bringing my portfolio to 160. Magazines: Pitch 5 new articles to print magazines by October 1. Do you still want what you thought you wanted in January? Are you making progress? Are you being specific enough with your goals? Each year, we make a LOT of progress in a few short months with our Breakfast Stock Club Summer Sprints. This summer, during July, August, and September, the goal is to shoot and upload as many photos as possible to your agencies! Anyone can participate, but Premium members will get TWO photo reviews per month… and everyone who submits to the Challenge gets a review. Just a little boost to build those portfolios for fall – historically the busiest stock photo buying season. Summer Sprints start on July 7… I’ll send a separate note with instructions next Friday! In the meantime, happy 4th of July!! If you’re here in the U.S., get out your camera and take some patriotic stock photos.